Honeywell is a large fortune 500 company that has been around for over 100 years. They make a wide range of products. They make thermostats, air cleaners, humidifiers, UV air treatment equipment, gas detection devices, heaters, fans, and more. Is a Honeywell air purifier right for you? According to their website, their products can be found in over 100 million homes and 5 million businesses throughout the world. 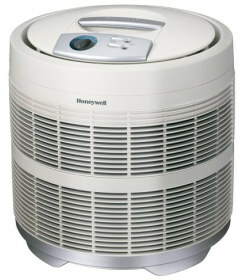 Honeywell has been making air purifiers for a long time now and they are very popular. There are currently over 10 different Honeywell air purifiers on the market with mostly positive customer reviews. These range from small tabletop models with a HEPA type filter to larger models with a true HEPA filter. The prices range from about $60 for a small table top model to around $270 for the top of the line model. Honeywell Air Purifiers use a variety of filtering methods. Honeywell air cleaners use a Honeywell hepa filter. Honeywell calls these filters either a True HEPA filter or a HEPAClean filter. A true HEPA filter is a genuine HEPA air filter. It can remove 99.97% of the particles .3 microns in diameter and larger from the air. The HEPAClean air cleaner filter is a HEPA type filter. This means it is not a true HEPA air purifier. The filter is similar to a HEPA filter, but it doesn't remove as many particles from the air. Honeywell QuietCare uses ionic air filters. Ionic air filter use electrically charged filters to clean the air. A couple of models use UV air purifiers. These air purifier are supposed to do a great job killing bacteria and household germs. We have organized our reviews of Honeywell air purifiers according to the filter type. Please click on the title of each section to read more about that type of filter. Honeywell offers a selection of air purifiers that use a real HEPA air filter. What is a HEPA filter? Simply put, a HEPA filter is a filter that can remove 99.97% of particles larger than 0.3 microns from the air. Who will benefit from these type filters? The short answer is everyone. The longer answer is everyone with allergies, asthma, breathing problems, babies, children, seniors, and everyone else. Some Honeywell air purifiers have a HEPA type air filter. What is the difference between these filters and a true HEPA air purifier filter. The biggest difference is in the size of particles filtered. These HEPA like filters only filter 99% of particles 2 microns in diameter out of the air. Some of these HEPA type air purifiers come with a optional ionizer. This can be turned on and off as desired. These purifiers will be best for someone who has airborne allergies, is on a budget, or just wants to have cleaner air. Anyone with asthma should make sure the ionizer is turned off. These air purifiers use an ionic filter. The filter is electrically charged to attract the particles in the air. Honeywell claims that these filter offer a near HEPA level of filtration removing 99% of the particles 0.3 microns in diameter from the air. Who will benefit from these filters? People with allergies and breathing problems will benefit from these filters. These are ionic air filters so they are not appropriate for anyone with asthma. Honeywell offers this model which combines three types of filtration systems. It combines a UV light filter that kills germs and bacteria, a HEPA Type filter that removes 99% of the particles from the air, and a Carbon / Zeolite pre-filter to remove odors from the air. Leave Honeywell Air Purifiers Page and Return to All About Air Purifiers Home Page.